"- "Probably the best known African woman writer". Adeola James "expertly shifts the focus of both the characters & the audience reader's attention and perspectives through a range of emotional, intellectual and social registers, effectively keeping us slightly off balance." VINCENT ODAMTTEN - UNIVERSITY OF FLORIDA "Her diverse literary achievements in drama, poetry, fiction and essays illuminate struggles and triumphs facing women and men in their post-independence Ghanaian society." KETU KATRAK, FEMINIST PRESS, NEW YORK. 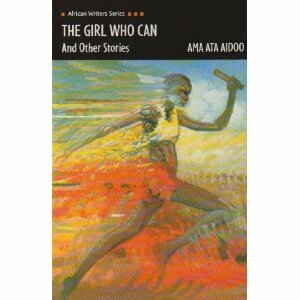 In The Girl Who Can, the irrepressible Ama Ata Aidoo looks at the roles and rules, and the games people find themselves playing, often unwillingly. She analyses African women's struggle to find their rightful place in society. Her stories raise issues of choice and conflict, teasing about the issues with disarming frankness. How do people behave in cross-cultural relationships? In the modern world, where a plastic label identifies us, what is our identity? Will African women be in the driving seat in the twenty-first century? With the zest and humour, Aidoo raises these questions and provides some challenging answers. In this collection of short stories, Aidoo elevates the mundane in women's lives to an intellectual level in an attempt at challenging patriarchal structures and dominance in African society. Written from a child's perspective, Aidoo subverts the traditional beliefs and assumptions about the child's voice. Her inimitable sense of style and eloquence, explores love, marriage and relationships with all the issues they throw up for the contemporary African woman. In doing so, she manages to capture the very essence of womanhood. Ama Ata Aidoo has distinguished herself as a writer and as a consultant on education and gender issues. She graduated from the English Department of the University of Ghana, Legon, where she was immediately appointed Junior Research Fellow of Advanced Creative Writing Program at Stanford University and, in the early 1980s, a Minister of Education in Ghana. While lecturing in the Department of English at the University of Cape Coast in the 1970s she was also appointed to serve on the Board of Directors of the Ghana Medical and Dental Council. She has travelled widely, and has been appointed Visiting Professor and Distinguished Visiting Professor to the English, Theatre, African, and African American Studies departments in a number of universities and colleges in the United States. She is the Executive Director of Mbaasem, a foundation to support African American women writers and their work. Her publications include the dramas The Dilemma of a Ghost (Longman, Harlow, 1965) and Anowa (Longman, Harlow, 1970); the short stories No Sweetness Here (Longman, Harlow, 1970); the novels Our Sister Killjoy or Reflections from a Black-Eyed Squint (Longman, Harlow, 1977 and Changes (The Women's Press, London, 1991); the poetry Someone Talking to Sometime (College Press, Harare, 1985) and An Angry letter in January and Other Poems (Dangaroo Press, Coventry, 1992); and the children's books The Eagle and the Chickens and Other Stories (Tana Press, Enugu, 1986) and Birds and Other Poems (College Press, Harare, 1987). Ama Ata Aidoo's many awards include the Nelson Mandela Prize for Poetry in 1987 for Someone Talking to Sometime and the Commonwealth Writers' Prize for Africa for Changes in 1992.